a person or thing that makes or produces something. Hey, friends! We're going to keep making introductions with our new Makers at the shop! Next up is my friend Jessica from Beyond the Stars Boutique. She's been with us since we've been open and also helps with rearranging and staging the shop from time to time. Her handmade jewelry is absolutely stunning and I literally want to buy a piece every time she brings in new items (and sometimes I cave...)! Jessica and her husband, Matt. Hi! My name is Jessica and I am the owner and designer of Beyond the Stars Boutique. I have always loved making jewelry ever since I was young. Over the years, my love of accessorizing from simply creating jewelry for myself and a few friends, quickly transformed from a hobby into a career. When creating my pieces, I’m drawn to eye-catching colors, different types of materials, and unique textures. My love for fabricating jewelry has pushed me to expand my knowledge and skills as a maker. From connecting simple strands of beads to hammering metals, manipulating wire, using vintage materials and natural elements, I strive to create a one of a kind look. I wish to create wearable art- not only because the creative process is enjoyable for me, but I want my jewelry to have a greater purpose and meaning for others! 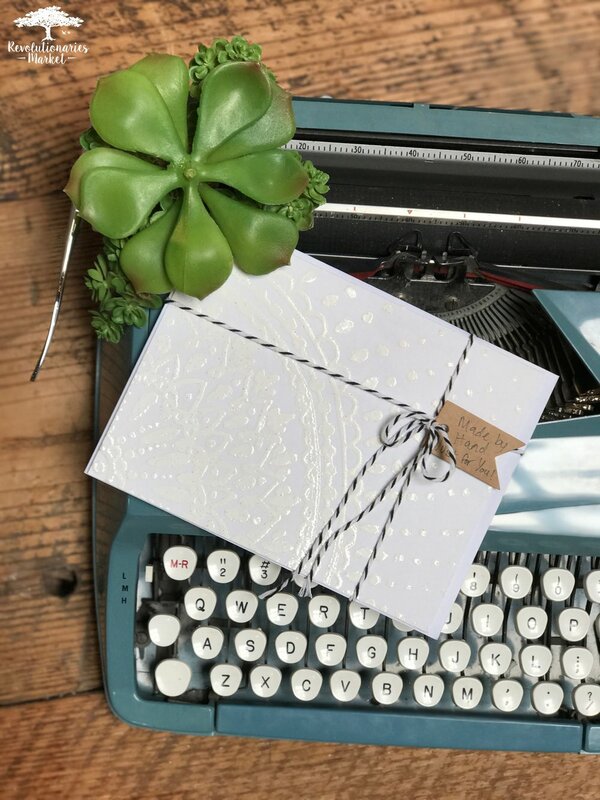 I have had the joy of working together with many clients to create special orders that they themselves designed on scraps of paper from ideas and thoughts near and dear to their hearts. Forming these ideas into tangible pieces that represent something so sacred as a physical reminder of people’s dreams and beloved memories, is absolutely amazing to me. Thank you so much for supporting small businesses and makers like myself. Let me create a piece that inspires you, encourages you, and brings joy to your soul! Help us welcome Beyond the Stars Boutique by saying hello in the comment section below! Meet the other Revolutionaries Market Makers! Hello again, friends! Like I shared in last week's post - Makers Gonna Make: Meet AddyLu Candles - we've added four new Makers to the shop in the last few weeks. To continue making introductions, this week we're featuring Josh at Hipster Perspective. He's actually not one of our four new Makers, and he's been with our shop since the beginning, but I still wanted to you all to meet him! Josh designed our logo, our website, and constantly helps us with marketing. Here at the shop we feature his beautiful prints and hand-lettered greeting cards! My name is Joshua Neal and I am the Founder/Creative Director of Hipster Perspective. I started Hipster Perspective back in college. Funny enough, the name was originally a joke but it stuck after a while and honestly I don’t think I could have named it better. I always knew I was destined to do something creative with my life. For a while I bounced around from interior design, marketing, and fashion. My very first passion in life was always music. So when it came time to go off to college I was trying to find something that would fit in with my music career. I ultimately landed on Graphic Design. I attended Full Sail University and graduated with a Bachelor's Degree in Graphic Design. I wanted to find something I could do freelance or full time. Something that would keep me from having to outsource too much of my music related products like album artwork, web design, and merchandise. Mostly because I wanted to have full control of not only the finished product but the design process as well. It’s a lot easier to make and sell a new t-shirt design when your doing everything yourself. I didn’t have to explain what I wanted to a third party, wait for a proof, hope they understood my vision, wait for changes to be made, and work out payment for design. I just designed it the way I wanted and sent it off to be made. Easy as pie. I also wanted to be able to help out other artists. Since I am a musician and I understand the struggles of this industry, I felt I could better relate to other artists who needed help with branding and design. I have been working behind the scenes on a lot of projects since graduating like creating album artwork for fellow bands, assisting in wedding decor, and even designing all of my own artwork, websites, and branding for my personal music career. Now I have turned to making my design business an equal part of my current creative situation. I love helping other people brand themselves online and teach them basic business tasks that everyone needs to know. I love what I do and I love encouraging others to go for that dream that everyone else says is crazy and unthinkable. We can do it, together. Help us welcome Hipster Perspective and come by and see his prints and hand-lettered cards!